Patrick Mulcahy and Joe Nelson of Mass Cannabis Chefs cook at a pop-up dinner. Photo courtesy of Mass Cannabis Chefs. What does cannabis taste like? Many people might describe it as earthy, pungent, or bitter. According to Joe Nelson, 29, of Plymouth, one of the chefs and co-founders of Mass Cannabis Chefs, the idea that all cannabis tastes the same is a misconception. “It’s different all the time, it’s different for every plant,” Nelson said. Nelson said that he has tried plants that taste citrusy and lemony, and plants that taste more like pine. As a chef, it’s his job to make sure that the cannabis product that he’s cooking with goes with the recipe that he’s making. Nelson usually cooks with a cannabis distillate, which is a refined cannabis oil that does not contain most of terpenes and flavonoids that are responsible for the taste and aroma of cannabis. “In certain dishes the flavors don’t pair well, so the distillate is good for that,” Nelson said. 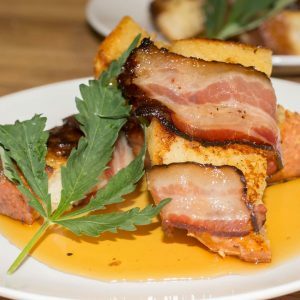 Nelson and his partner Patrick Mulcahy founded Mass Cannabis Chefs in 2016 after working in restaurants together and bonding over cannabis. 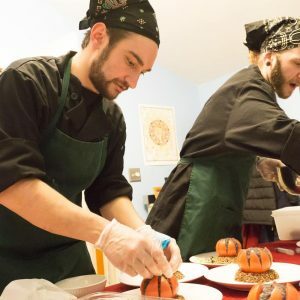 While most of their pop-up dinners have been on the Eastern side of the state, Nelson said that they are hoping to make their way to a Western Mass location soon. 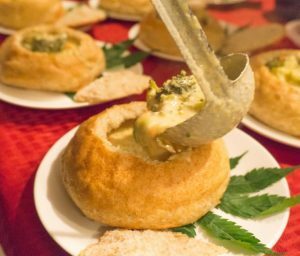 Public social consumption is not yet legal in Massachusetts, so in order to operate legally Mass Cannabis Chefs host their pop-up dinners in private residences and don’t charge extra for people who want their meal infused with cannabis. “We charge for food and services,” Nelson said. A dish made by Mass Cannabis Chefs at a pop-up dinner. Photo courtesy of Mass Cannabis Chefs. “We try to do different things every single menu,” Nelson said. Mass Cannabis Chefs hosts two pop-up dinners a month in addition to private parties. Nelson said that they have a deconstructed comfort food night coming up, a ramen night, and a sushi night. When patrons arrive to a dinner they tell Nelson and Mulcahy what dose of cannabis they would like, if any. Nelson said that a big plus of using the distillate is that it can be tested beforehand for exactly how much tetrahydrocannabinol (THC) it contains. With that number in mind, Nelson and Mulcahy can create a perfectly dosed meal depending on each person’s needs and preferences. 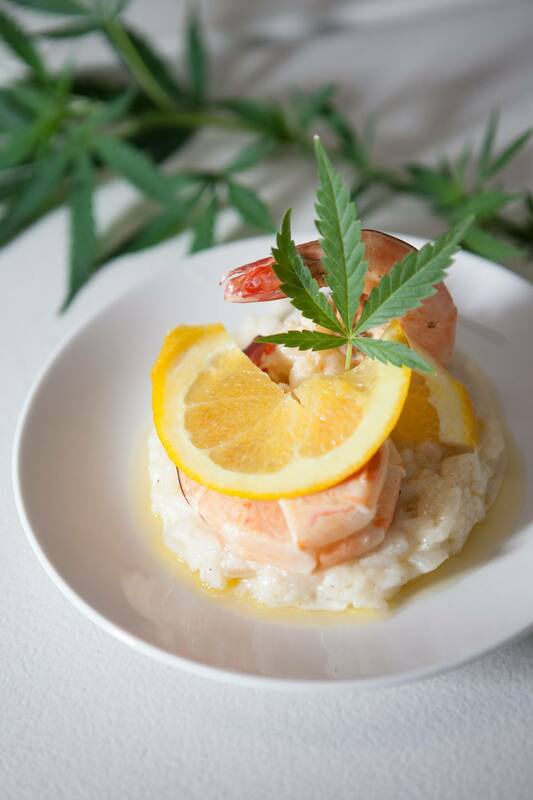 Each course of the meal is designed to have one element that can be infused with cannabis. Nelson explained that THC infuses best with fats, sugars, and alcohol, which is why many people infuse butter at home. Even distribution is also important to accurate dosing. Nelson said that one of the things that they are interested in making but haven’t yet figured out how to infuse are pickles. Nelson explained that because pickles are primarily made of vinegar and water. there is nothing for the THC to bind to. “They’re one of my favorite things and we can’t infuse them,” Nelson said. Luckily, lots of great recipes do contain fats, sugar, and alcohol. Nelson said that one of his favorite dishes was a peppercorn crusted filet mignon dish that they served at their one-year anniversary party. The dish included a pesto made with a more surprising part of the cannabis plant, the fan leaf. Fan leaves are well-known for their distinct and recognizable shape, but they don’t have a high THC content and are not generally very valuable. Nelson hopes that someday he and Mulcahy will be able support themselves entirely with Mass Cannabis Chefs. When asked about whether or not he would apply for a social consumption license in the future, Nelson said that he hopes that the Cannabis Control Commission allows one to three day licenses for pop-up venues and weekend dinner services.